SCOTTISH Borders Council could be forced to pay £4.5 million and unspecified legal costs if it loses a civil action due to be heard at Edinburgh’s Court of Session next month. It has been brought by London-based consultancy firm D & P Management Enterprises Ltd whose director Barry Phelps was engaged by SBC in 2008. 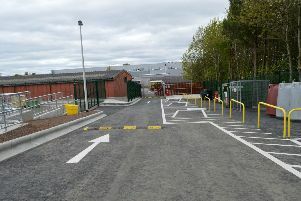 His role was to assist with the procurement of one of the biggest contracts ever undertaken by the council – for a state of the art integrated waste management facility at Easter Langlee in Galashiels. The plant, due to be operational by 2017, is needed to divert the region’s rubbish away from expensive landfill and meet Scottish Government recycling targets. Mr Phelps spent three years in the role of procurement head for the project, and in April 2011 a contract worth £65 million was awarded to New Earth Solutions. Mr Phelps was paid a day rate monthly but claims he also had a “gain share” agreement whereby he would receive fees calculated on the savings he achieved for the council. But the payment he believes he is entitled to never materialised and, in August, 2013, his company began legal proceedings against the council. “I had tried in vain for two years to come to an agreement with the council, even offering an 80% discount on the fees I was due,” said Mr Phelps. He has already spent £300,000 on legal expenses, on top of the £100,000 he is now required to lodge as security after a debate on “technical issues” at the Court of Session on Friday. The case will be heard by Scotland’s highest civil court on March 24 and is expected to last at least 11 days. SBC has engaged the services of top legal firm Brechin Tindal Oates to defend the claim. A council spokesperson said: “The claim relates to the recovery of alleged outstanding payments arising out of gain share provision. “SBC disputes this claim in its entirety and is defending the action on the basis that no sum is due to the company [D & P Management Enterprises Ltd]. “In terms of legal fees, the council has so far spent £30,316 but if the council successfully defends the claim it will recover its costs.